You may be caught in a buyers’ market: Over 90,000 baby boomer businesses are going through a change in ownership this decade. In a recent survey by Rothstein Kass, 95% of owners reported that getting the best price remains their central concern when contemplating sale of their business. There are eager buyers for small and midsized companies whose owners have powered through the recession and expect to see demand rebound this year. While business sales fell dramatically in 2009, the number of deals has increased since 2010. With few business assets in supply and high buyer demand, valuations for high-quality companies have held surprisingly steady. Whether you exit as a brand sale, or end up as a fire sale, will depend on what you do well in advance to increase the value of your business. The key to a successful business sale is knowledge, plus a well thought-out plan. The health of your business and your brand. Its appeal to a buyer who is willing to spend the money. Your realistic perception of what your business is worth. Your readiness as a business leader to step aside and move on to new projects. However this can take a lot longer for many since most owners do not have an effective ownership exit or transition plan in place. Without a plan most businesses end up in a very different place than they intended. If faced with the unforeseen, like the loss of the key family member or investor, without an exit plan and a business that is well positioned for a sale, the business can be devalued and not gain maximum return on the investment. How to build a business that is worth more? Most buyers will be looking for a business with an upside and will be assessing the risk very carefully. The biggest driver of whether you sell your business is usually dependent on sales growth and profitability. Strong valuations correlate with positive trends in both areas. The baseline goal is to get the best return you can from your hard work and have a business at the end of it all that provides financial stability. This holds true whether you seek to sell your business to an outsider, to your employees or to your children. Even if you plan to remain in your business for the next 10 years, your business’ net worth has an immediate impact on your income and your ability to raise growth financing and equity. Stop and take stock. You need an outsider’s perspective. Justin Gagnon, CEO ChoiceLunch, observes, “Owners have a hard time assessing their own weaknesses. Private business owners easily become mired in day-to-day operations and can lose valuable perspective. If I were thinking of selling, I would hire someone like Scion to do a diagnostic scorecard, and then focus a plan on those areas that need fixing.” An objective assessment of both internal and external forces impacting your business’ health enables you to understand both strengths and weaknesses from a realistic standpoint, so you can focus on filling key gaps: within your team, operations, product, sales channels and market position. Define what success looks like for you. Having clearly prioritized long-term goals is important. “If you don’t know where you’re going, any road will take you there,” A clear vision of your objectives allows you to make the best decisions related to your exit strategy. For some, success could mean optimizing current business performance to maximize growth and profits. For others, it could mean preparing the business for an exit strategy, such as a sale or family succession. If a sale is the ultimate goal, you will need to identify the optimal buyer’s profile and learn what they are looking for. 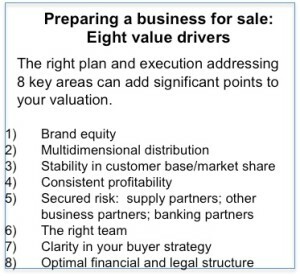 This includes an understanding of the value drivers they will use to determine an offer price for your business (see sidebar, “Types of Buyers”). Build your transition team. Preparing for a sale to a 3rd party or to your kids can be daunting and highly disruptive to your day-to-day business operations. To minimize distractions, limit the involvement of your internal team and instead appoint a group of advisors who can manage the process and bring knowledge from their functional areas of expertise and past experience completing transactions. “Along with your internal team, outside trusted advisors can be invaluable help in accelerating your learning curve, as well as provide insight, clarity and objective guidance in a process that can be both complex and emotionally taxing”, says Don Buder, Partner/Davis Wright Tremaine LLP. Get your business ready. The first step in the transition planning process involves getting your business ready for the right buyers. This can take 2 to 3 years and this is where Scion can help. 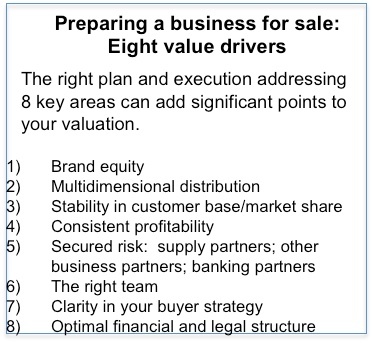 (See sidebar, “Eight value drivers”). “Working closely with owners in recent years, we have seen their commitment combined with our process generate serious results such as growing EBIDTA by 5 times within 3 years and building profitability with a more rationalized product and channel strategy. At the core of each of these successes was a realistic plan and an aligned group of owners,” says Scion founding partner Deborah Steinthal. How to prepare emotionally to transact? An important step for all entrepreneurs is being emotionally and financially ready to sell. The most successful have a holistic approach to the liquidity event. They plan for the future, not just the current year and exit price. To help you let go, you need to move towards a rich and personally rewarding future, and may consider a life coach or spending serious time developing a playbook covering your post transaction years. It all comes down to brand strength and financial performance. At an industry conference, Dan Duckhorn of Duckhorn Vineyards stated, “a strong brand is paramount to a successful sale”. Avoid being a fire sale. You will have a much better opportunity to come out ahead by taking control of an exit plan that maximizes brand strength and financial performance. 1. Baby Boomer “Age Wave” Report 2007: First boomers turned 62 in 2008. Own 65% of private businesses in U.S. 40% will exit within 5 years, 80% will exit within 10 years. 2. 58% do not have a plan.